What has your experience with it, please. Sorry, my last message was unclear. "What has your experience with the PiTop been, please? No it wasn't. A "PC" is generally taken to mean "Personal Computer" in this context. I'm guessing you did not personally own that gigantic mainframe and it was not there for your personal use. Sounds like a great "first computer" experience though. My first PC I on was a gigantic Mainframe at a Burroughs. On that basis I claim a CDC 7600 super computer. On that basis I claim that I have no idea what my first PC was. I connected via a teletype from my Technical College, using a telephone and acoustic coupler. The machine I connected too was a mainframe far away. I don't think I ever knew what it was or at least I have forgotten a long time ago. I was using BASIC and learning assembly language with the help of a simulator so it was of no concern what the machine actually was. Or perhaps my first PC was an Intel MDS II. It was certainly the first computer I could see and touch and have exclusive use of. I had the disc drives at the bottom so as to get a more natural view angle to the monitor. Today PC generally means politically correct and nothing to do with personal. Computers are mostly used against people rather than for people, used to control people rather than free them. Time to change all that--we need a People's Computer Company. It is notable that this statement was made more than 10 years before Richard Stallman started the GNU project. At some point in time, IBM appropriated the term PC to refer to the 5150, which we know as the original IBM PC. Just like the Raspberry Pi Foundation was unable to trademark the Greek letter Pi, so too was IBM unable to trademark PC. Anyway, around this time PC stopped referring to a computer designed to serve an individual's personal needs and interests to a computer used by a single person in a corporate office setting. What I find interesting is how little it matters to most people whether they are in control of their computer or whether their computer instead controls them. Given how many dogs actually take their owners for a walk when they go outside, maybe this isn't so surprising. Still, it is worth consciously reflecting on what is at stake when trading the freedom which comes from open-source and writing your own for the convenience and resulting digital feudalism which comes from using software owned and controlled by a corporation or someone else. Having said this, from a childish point of view everything in the world is a toy. Thus, for a child to consider a mainframe owned by someone else to be their own personal computer is natural, even though a wise adult knows otherwise. This is also why keeping the price point of the Raspberry Pi cheap enough so a child can own it is an effective way to encourage learning that might otherwise disrupt the use of more expensive machines. Well, I did say one post up that ""PC" is generally taken to mean "Personal Computer" in this context". We are talking about computers right? I don't think I had a "politically correct" as kid. Actually I still don't have one. Anyway I disagree that PC generally means "politically correct" now a days. That went out of fashion a decade or two ago. Today it's all SJW this and CoC that. You are right though, I guess most kids today don't think personal computer when they see "PC". Wikipedia puts "politically correct" way down the list of interpretations, under "other uses". That's interesting about the "People's Computing Company"
If you would like to see the vision California educators had in the 70's on how computer literacy and personal computing could transform education, back issues of The People's Computer Company are archived on the website of the Computer History Museum here. From my point of view, the Pi has effectively recaptured the original meaning of personal computer as a computer designed to serve an individual's personal needs and interests. The GPIO and related physical computing projects make the Pi very different from an office computer used in a corporate or home setting. Thus, the Pi appeals to makers, hobbyists, children and educators in much the same way that the original 8-bit microcomputers used to. As this was the original intent, the only thing surprising is that the P in Pi stands for Python rather than personal. I think the Pi has pushed the personal computer concept down a level. Where the PC idea was "one person, one computer", the Pi gets it to "one task, one computer." The first time I got my hands on a real computer was in the summer of 1962. 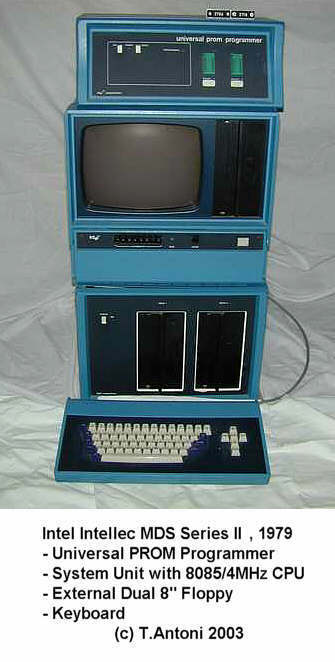 Texas Tech in Lubbock took delivery on an IBM 1620. See IBM 1620. I was between my sophomore and junior years at Rice University, but my summer job back home in Lubbock fell through, so I enrolled in some classes at Tech so I could justify playing with the computer. They had not got the assembler for it (let alone any compiler), so I was reduced to programming in machine language. That was decimal on punched cards. Because it was a variable length word machine I was quickly able to program it to compute e to a great many decimal places. But what I really count as my first program was a program to play 3 dimensional tic tac toe on a 4x4x4 board. It was non-trivial, yet entirely in machine language; and it eventually played a pretty good game. I was delighted the first time it beat me. Ah...fond memories of the IBM 1620. San Diego State had a 1620 Mod I (there was a Mod II....the differences were...interesting). My sister was a student operator on it. The assembly language was SPS, and since their 1620 had a disk drive cobbled onto it, it was SPS IID. They also used FORTRAN IID. In the summer of 1964 I got invited to hang around a somewhat informal session and leared both SPS and FORTRAN. Our first family computer was a Commodore Vic-20, purchased second hand My brother and I definitely put it through its paces and did a lot of coding and game playing on it. I had also been exposed to the TRS-80 at a friend's place, as well as booking time on the Apple IIe at the local library to play King's Quest We later got a 486 which blew me away at the time! Over the years I had an Amiga 500, some Commodore PETs and some big UNIX workstation with terminals that I never did really use. Now it's mostly *NIX on laptops and my Pis. Commodore 64. I still have it but it doesn't work anymore. I suspect it's a fault power supply. Congratulations. That is a nice computer. Have you tried Raspberry Pi Desktop on it? compared to what people are currently using--either that or we'll all be using clay tablets because they're more environmentally friendly. I think my dad got a Hewlett Packard 9000. I remember windows 98. I was like 4 years old. My oldest grandson is 10... So, yes, you're young, but that will change in time. In the mean time, enjoy your youth while it lasts. Mine was Pravets 16 with Intel 8088 at 4 MHz, RAM 256KB expandable to 640KB. My first computer is Pentium 3 with 2GB ram at that time it is sufficient for me and loves to work on it. but nowadays no one wants to use slow PC every one love speed and save time I am a writer and photographer I love to write about animals and their wildlife I started my recent blog on it HunterHunts. I don't know how it going on but I love to write and follow my passion. Sometimes I love to play games plz suggest me a good gamer laptop or Pc. Are you sure there was 2GB RAM on that Pentium 3 computer? Many Pentium 3 motherboards were built using an Intel 440BX or 815 Northbridge that only supported 512MB maximum. VIA had a chip set that supported more and there must have been a server-class motherboard from Intel that did the same. Do you remember any more details? mine was the Apple 2. I remember there was a pinball game, a space station game, a Where in the world is carden sandiego game. I got some good childhood memories of that thing. A Commodore Vic-20, set aside my paper round cash for 15 months and got it in 1982. At that point spent as much on an afron interface, which was a case the Vic-20 sat in and had a worked in power supply and 8 openings for cartridges, was capable at that point to get it from a 3.5k machine to 59.5k. did my programming O'level on a Commodore PET and my Vic-20.. Went on to having a C64, Amiga, Amiga 128, Spectrum 128, IBM AT, IBM XT, Pentium 2 and so on and so forth, gone are the overwhelming long stretches of working out fuel/mileage utilization for an armada of vehicles utilizing lotus 123 running on an AT PC (around 1986). As a beginner to the Raspberry Pi and as I hit 50 this year I chose that the Pi would be an extraordinary spot to get again into coding and to have a financially savvy apparatus that I ought not have the capacity to break. I have setup a Pi ZeroW running OSMC as a media focus with a terabyte drive all controlled and LED lit from a USB Hub, case still to be finished. I likewise need to figure how to get the stuff onto the drive without evacuating it and connecting to my PC. Am occupied with working my way through the CamJam EduKit 1, and am endeavoring to compose code that would yield what I type straightforwardly as morse code click here for more details using this website ( my musings are that as I hit return the pi would then yield that line composed) still a work in advancement. Any thoughts anybody? Oh come now. Those electrolytics are easily replaced with new ones. If you did not learn to solder as a kid now is the time! It's good for the soul. Please also note that using a signature with an URL in it is also frowned upon.